Indiana GOP To Revisit Law; Paper Weighs In With Full Page Editorial : The Two-Way The Religious Freedom Restoration Act stoked controversy almost from the moment it was passed by the state's GOP-dominated Legislature and signed by Gov. Mike Pence on Thursday. 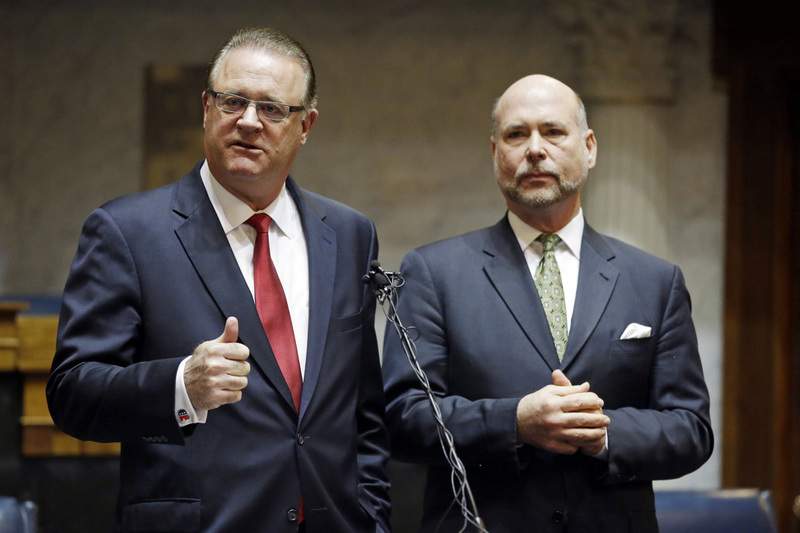 Indiana Senate President Pro Tem David Long (left) and House Speaker Brian C. Bosma, both Republicans, discuss their plans for clarifying the Indiana Religious Freedom Restoration Act during a news conference today at the Statehouse in Indianapolis. The Indianapolis Star's editorial board is weighing in on the matter, rather loudly, in tomorrow's edition. Two Democrat-dominated state governments, Connecticut and Washington state, joined the boycott against Indiana on Monday. Governors Dan Malloy and Jay Inslee both separately announced that state-funded travel to Indiana is forbidden until further notice. Meanwhile, in an opinion piece published by The Wall Street Journal, Indiana Gov. Mike Pence continued to defend the law, saying critics have grossly misconstrued it and that it's not a "license to discriminate." "Indiana University law professor Deborah Widiss said the Indiana law closely tracks the federal law as the Supreme Court interpreted it in last year's Hobby Lobby case, which found the retailer and other closely held private businesses with religious objections could opt out of providing the free contraceptive coverage required by the Affordable Care Act." Republican leaders in Indiana say they will work to ensure the state's controversial Religious Freedom Restoration Act does not allow discrimination against gays and lesbians. "This law does not discriminate, and it will not be allowed to do so," Indiana Senate President Pro Tem David Long said at a news conference with state House Speaker Brian Bosma. They said they would "encourage our colleagues to adopt a clarifying measure of some sort to remove this misconception about the bill." The Associated Press says that the measure "prohibits state laws that 'substantially burden' a person's ability to follow his or her religious beliefs. The definition of 'person' includes religious institutions, businesses and associations." As NPR's Scott Neuman reported over the weekend, Pence in media interviews said he supports an effort to "clarify the intent" of the legislation while acknowledging surprise over the hostility it has sparked. Pence and other supporters of the measure note that Indiana is not the only state with such a law on the books. But as Scott noted, "Although the law is similar to a federal one and those in 19 other states, sexual orientation is not a protected class in Indiana, leaving the door open for discrimination, critics say." At today's news conference, Long said the law "doesn't discriminate, and anyone on either side of this issue suggesting otherwise is just plain flat wrong." Bosma added: "What it does is it sets a standard of review for a court when issues of religious freedom and other rights collide due to government action." Democrats want the measure repealed, but Long and Bosma said that was unlikely.